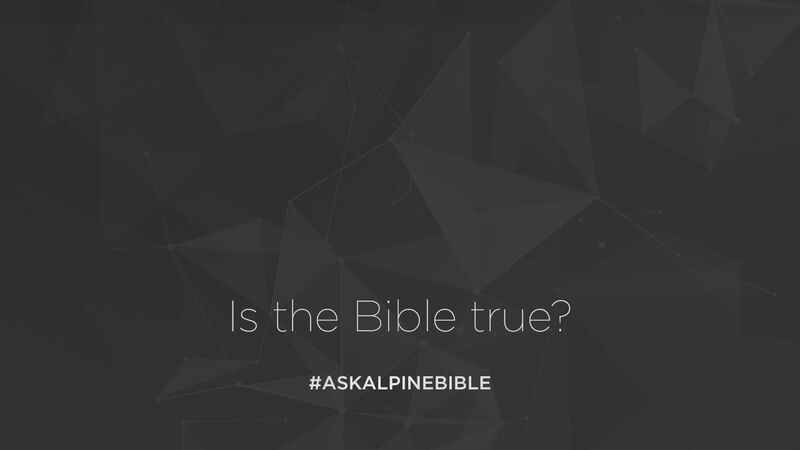 How do you know the Bible is true? That is a great question, because it is the foundation from which you learn about the Lord. It’s important. And the Bible, when you think about it, is a pretty powerful resource. It remains the most printed book, the most translated book, and the most frequently read book in all of the world. To know whether or not the Bible true, it’s important to let the Bible speak for itself, at first. And then we can validate it outside of scripture to see whether or not it is trustworthy. But the Bible says in 2 Timothy 3:16, “all Scripture is given by inspiration of God.” The word inspiration in that text literally means, “God breathed.” It is God’s spoken word. Paul was intentional on the way that he use that word inspiration within the Bible. Because the Jews knew that God’s Word was powerful. In the Old Testament when a prophet came to reveal truth, they would say, “thus saith the LORD.” Thus saith the LORD. God’s Word, and they would see that prophetic statement becomes reality, and God’s Word had power. When God made in the beginning, he spoke, and creation began. So all Scripture is given by inspiration, and in the 2 Peter 1:21 it tells us, “no man wrote according to his own way, but was carried along by the Holy Spirit.” The Holy Spirit gave us His Word. Here’s the wonderful part about it, is God’s didn’t use men as robots to record His word. He used men in their talents to record His word. So when you read the Bible that’s why you see a gamut of literature styles. Coming from intellectuals, to people that wrote in very basic English. John’s language is very basic in the Greek text, versus Luke who was a doctor, who wrote the book of Luke and Acts. He is very detailed and precise. David was an artistic man who wrote the songs, the songs of God. God’s Word was inspired. In fact, Jesus even validated the scripture when he came along. He told us that not one jot or tittle would pass until all was fulfilled. He quoted the Old Testament itself as one of of authority. In Matthew, when Jesus goes into the wilderness to defeat Satan, he quotes the Old Testament to do so. God’s word has power. Peter referred to Paul’s writings as scripture and Paul himself quoted both the Old and New Testament and called both of them scripture. Paul quoted from the book of Luke and called it scripture. So how do you know it is trustworthy then? The Bible has several ways for us to validate it. I would start with the first point, which is prophecy. We have Old Testament manuscripts older than Jesus himself. Hundreds of years older than Jesus, proving and validating and prophesying His coming. Jesus fulfill those prophecies, which points to the validity of scripture. Archaeologically, the Bible is still being uncovered. Events and places that are available and recorded within the Bible. In fact, you can get on eBay today and buy biblical archaeologically. One of the easiest is the widows might that is recorded in the gospels. The Bible itself has one theme. What book do you know, that was written over a period of 1,500 years with over 40 different authors, that has one theme? Which is this: God has been pursuing us for relationship in Him, through redemption in Christ, that we may enjoy Him for eternity. What about it’s absolute honesty? I mean, you think about people like Peter or David. Peter abandoned Jesus. But when it comes to the Gospels and you read about Peter and his life, he’s honest in saying, “this is who Jesus was and yeah, that’s me. I failed.” And David does the same thing. Or what about even women coming to the tomb in the 1st century when when the testimony of women wouldn’t even be validated. And Jesus is using the testimony of women to validate that he himself was resurrected from the grave. It’s honesty is unbelievable. The fact that it reads me better than I read it. It’s like the Bible can pierce into my heart and understand me. What about it’s historical accuracy? The way it is precise over details. What book does that? What about the way it transforms life. Or how about this: the way it’s been preserved. We have over 25,000 manuscripts that total over 1.8 million pages of the Bible, dating back to the early 2nd century into the 1st century. The Bible wasn’t even finished until the end of the 1st century. That’s for the New Testament. In the Old Testament you have manuscripts older than Jesus—the Dead Sea Scrolls. Went when we talk about reading the Bible today, we’re reading 1st century manuscript’s translator for us into English. There is no book that can even compare to the validity of the Bible and it’s trustworthiness. The Bible stand on a pillar of foundation. It’s revelation to us is important. It is special. It’s where we meet God. It’s how God reveals who He is, for all generations. Get into it. Appreciate it’s preservation and it’s importance. And come to know the God who desires for you to know Him.